Over the past few weeks The Walking Dead has been focused on the emotional impact the loss of the prison has had on the characters. I feel it’s been done to varying degrees of success, with some episodes furthering the story and developing the characters, (“Claimed”) and some seeming more like time fillers (“Still”). Each week has focused on just one or two of the groups now that everyone is separated. Since I missed reviews for the last two let me just recap my thoughts on those for a second. Two weeks ago we had “Still,” featuring only Beth (Emily Kinney) and Daryl (Norman Reedus). This was my least favorite of the bunch because I didn’t feel we learned anything new about the characters and I certainly wasn’t aching for a bond between these two. Last week in “Alone” we added Maggie (Lauren Cohan), Sasha (Sonequa Martin-Green) and Bob (Lawrence Gilliard Jr) and things got much better. Those three edged closer to the mythical Terminus, while Daryl and Beth holed up in a funeral home. Their story became much more interesting as Daryl was nearly killed by a herd of walkers and Beth was kidnapped. Moving on to this week, we have “The Grove.” This episode was one of the most emotionally charged of the entire series. If you haven’t seen it, please don’t spoil it by reading any further. This time around we were following Carol (Melissa McBride), Tyreese (Chad L. Coleman) and the two young girls in their charge – Mika (Kyla Kenedy) and Lizzie (Brighton Sharbino). I said a while back that Lizzie could prove to be a loose cannon that everyone needed to watch out for and I was right. So convinced that that walkers are people who are “just different,” she kills her little sister Mika because she wants to prove to everyone she is correct. If there is anything that proves Rick’s fantasy of building a new and civilized society is impossible, it’s this episode. Growing up in the zombie world made what was probably an already unbalanced child completely out of touch with reality. What can be done? There are no psychiatrists or hospitals around. 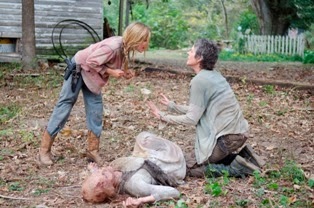 In something like a twisted variation of Of Mice and Men, Carol kills Lizzie. She doesn’t do it out of rage or retaliation but because, like the Steinbeck story, it’s the only solution. Perhaps we are supposed to question if she did the right thing, but I don’t. Every time they showed Lizzie holding baby Judith, I cringed thinking she would kill her. While I certainly wouldn’t advocate the death penalty for people like Lizzie in the real world, this is not the real world. As Carol points out, people have to change. But change how much? Carol was trying to toughen up the more timid Mika, only to realize in the end (and too late) that there is still value in a child’s innocence. Clearly she had been thinking that if she had toughened up Sophia a little more, maybe her daughter would’ve still been alive. The episode was heartbreaking all around, not only in the loss of the two girls but also the loss of any sense of contentment. For a moment they had found a home and had been able to relax. 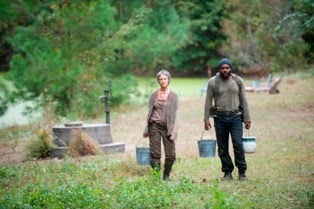 For the first time since being with Karen, Tyreese had let himself feel happy. And of course he received a double-whammy when Carol confessed that she was the one who killed Karen. So Tyreese knows he had better forget about any other life than keeping ahead of the walkers and trying to stay alive by any means possible. Overall I would say this was one of the best episodes of the season. I’m looking forward to seeing what Terminus is – if it really even exists. I’m hoping they explain that weird fire that Carol and the others saw in this episode and why there was a whole bunch of charred walkers that came through the woods. I’m most interested in the new people Glenn (Steven Yeun) is with and what secrets about the walker plague they may have to offer. I can’t wait to see where this all goes in the final two episodes of the season. This episode almost made me cry. I knew Lizzie was going to be an issue early on when she was feeding the walkers mice. I thought it would be Judith, not Mika. Ugh. That made me very sad. The fire. I think honestly, that fire was the one set by Daryland Beth, aafter they got drunk and set the house on fire. I could be wrong, but that is what I was thinking the whole episode. Can’t wait until Sunday.